The latest piece of art to be installed in the Library is Talley Fisher’s “Soft Rains,” which hangs from the window well over the book return. Photos, videos, and articles used with permission of the Mount Prospect Public Library. “Our Town Bellefonte.” A look inside the studio from Penn State Public Broadcasting. Talley talks about different projects and the creative process. Centre Daily Times, July 7, 2012. “Installations Take Flight”. Article on the Desert Sunrise, Waterfall, Blue Arroyo installation at McCarran International Airport, Terminal 3, Las Vegas, NV. Medical Construction & Design Magazine. 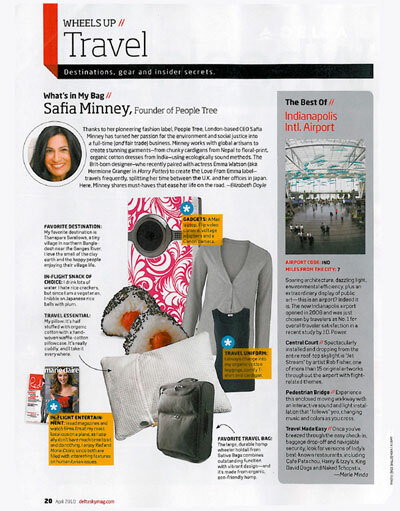 May – June 2012 Issue. Cover story and image. Susquehanna Reverie installed in Susquehanna Health System’s Patient Tower, Williamsport, PA. View Go to pages 36-37. Healthcare Design. February 2011, Vol. 11, No. 2. Cover Story and image. 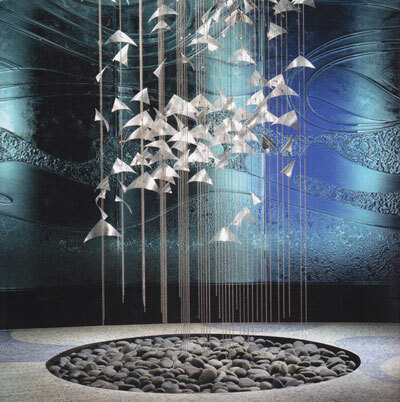 http://www.healthcaredesignmagazine.com/magazine-issue/february-2011 Click on “Healthcare Oasis”, and then on image gallery to see Crescendo suspended in the lobby of Eisenhower Medical Center in La Quinta, CA. TRUMP Express. February, 2010. Back cover photo and review of Sea Turtles, One Ocean Resort, Atlantic Beach, FL. A sculpture is more than art. It is a mark of the society in which it appears. 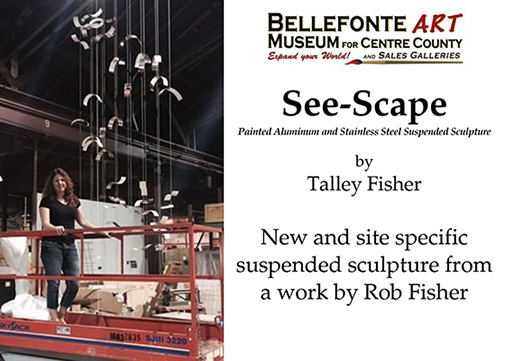 Talley Fisher, from Rob Fisher Sculpture, LLC, conveys thoughtful ideas for the world to decipher and interpret. Whether the artist is articulating a concept or inspiring a thought, each piece is planned, configured and crafted beautifully and philosophically. Total Manufacturing Company (TMCO)’s Metal and Art division recognizes the passion of Talley’s sculptures. With the TRUMPF tools to transform metal into artistic outlines, TMCO makes it possible for her to create works of art from pieces of metal, forming concepts into tangible reality, as seen in “Sea Turtles” at One Ocean Resort. Atlantic Beach, FL. 2009 Are you? CENTRAL. Issue 03, 2009. “A Touch of Magic”. pg. 92. Article on Talley Fisher and the sculpture, Harbour Magic, created for a harbor view residential building in Hong Kong. 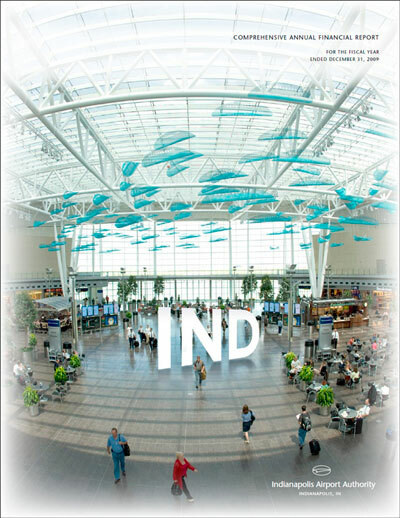 Indianapolis Airport Authority Comprehensive Annual Financial Report for fiscal year 2009. Cover photo of JetStream, 2008. Centre Daily Times, Dec. 1, 2008. “Reaching to the Heavens”. 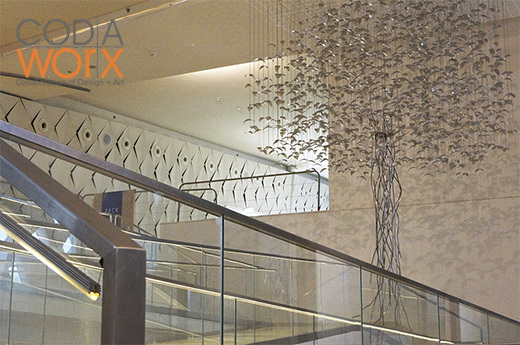 Article on the design of Rob Fisher’s JetStream suspended sculpture in the Indianapolis Airport and the subsequent fabrication and installation of the monumental work after his death by his daughter, Talley Fisher.